Note: All vinyl dolls, regardless of the manufacturer, can become shiny or slightly oily over time. While many doll makers and sellers may pretend this problem doesn't exist with their dolls (which it does - it is a part of the chemistry in vinyl production) we are willing to not just acknowledge it, but offer a solution! If you follow our directions below for a painted or unpainted Secrist doll kits you can effectively protect your dolls from this problem. This tutorial is for Secrist doll kits or doll kits using Authentic Reborn paints - using this tutorial for doll kits from other manufacturers may yield different or negative results. Always ask the manufacturer of your doll kit before proceeding. For years now people have been running into oily vinyl doll parts. Some say it's caused by baby fat pellets, while others say it is caused by the kinds of coating and paints reborners try to use. Regardless of the cause, everyone would like to know how to get rid of it. Here is a process that worked for me. 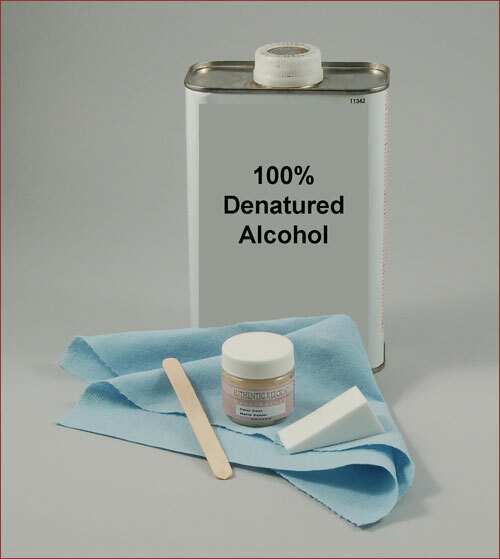 Odorless thinner won't do the job, however, 100% denatured alcohol will. Be sure to get a good brand so you don't get discoloration on your vinyl, due to impurities in the denatured alcohol. You will need lint free paper towels so your baby doesn't end up coated in paper towel fuzz. You will also want a cosmetic sponge, craft stick and superior shine remover. You are probably saying to yourself, "Why superior Shine Remover when I don't have a shine problem?" Superior Shine Remover is the most durable, long lasting sealer on the reborning market today. It won't rub off like so many other sealers. You want to be confident, once you seal your vinyl that it will never come off. Here's the oily part that I worked with. I soaked a little denatured alcohol onto my lint free paper towel, then, I wiped off every bit of oil on the vinyl. It's best to wipe off the entire surface even if you don't see any oil on it. I used a craft stick to scoop out the Shine Remover sealer from the jar and then I applied it to the cosmetic sponge. If your Shine Remover is a little stiff, or paste-like, then you can add odorless thinner to soften it up. I added 12 drops to a 1oz jar, or 6 drops to a petite jar. Stir well until it becomes creamy soft. I applied the Shine Remover sealer to the vinyl part with a pouncing action until the Shine Remover Sealer disappeared, leaving a very thin transparent layer. You can also try dragging the sponge across the vinyl for a smoother texture. You can see how the oil is gone and the part looks good. The Shine Remover will keep the oil from coming back to the surface. That's why you want to coat all the surface so there won't be any oil showing up on the part. That is also why you want to use a permanent flexible vinyl sealer, like Superior Shine Remover.